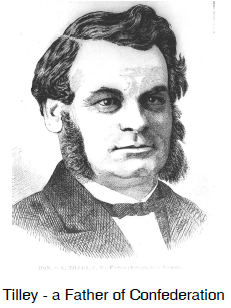 Leonard Tilley was a successful druggist in St. John, New Brunswick before he entered politics and eventually became premier of the province. Tilley was involved in railway expansion and favoured commercial union, and therefore, political union with the other British colonies. Tilley attended both the Charlottetown Conference of 1864 and the Quebec Conference and helped negotiate Confederation. Opposition to Confederation in New Brunswick was strong enough to defeat Tilley in an election in 1865, but the new government quickly lost the support of the people and Tilley and his party were re-elected the following year, in time for him to take his place as one of the Fathers of Confederation.